In an alliance more significant than the Federation and the Klingons, than Voyager and the Maquis - even more than Will Riker and his legendary facial hair - it's the Star Trek Where No Man Has Gone Before Collection! This Randomly picked vinyl figure comes in a blind package box. The collection features characters from the first season of the groundbreaking science fiction phenomenon led by the unforgettable trio of Captain James T. Kirk, Mister Spock, and Doctor Leonard "Bones" McCoy! 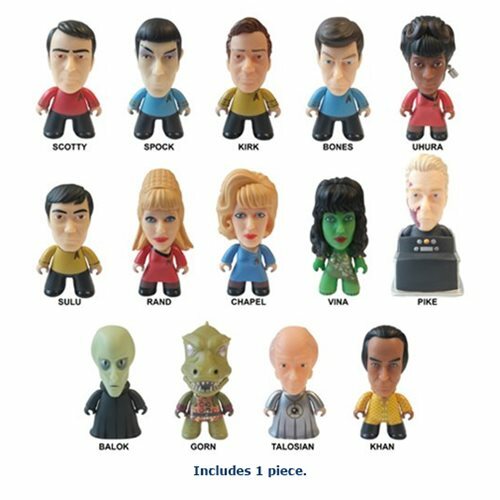 All of the iconic bridge crew and villains from Season One of Star Trek: The Original Series are represented in this blind-boxed wave as well! Collect Uhura, Sulu, Scotty, Nurse Chapel, Yeoman Rand, the mysterious Balok, the manipulative Talosian Keeper, the terrifying Gorn, and the legendary Khan Noonien Singh! Each figure is 3-inches tall, blind-boxed, and certain pieces come with a character-specific accessory. Ages 15 and up.